Terik Donato has lost his place in the universe. Casting aside a promising career, years spent in fleeting pursuit of truth has left him with nothing. But an ill-timed visit to the Sacramento, a space vessel well past her prime, could change everything for the former Mako-6 agent. 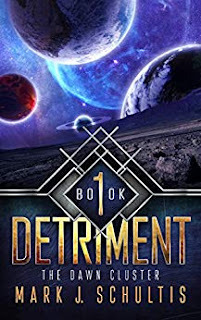 Terik’s arrival vexes many on board, including Captain Garett Soness, but when both a terrorist attack and a bizarre anomaly catch the skeleton crew off guard, all onboard must band together. Soon the surviving crew members of the Sacramento find themselves halfway across the galaxy, stranded on a planet where humans are not as alien as the crew would think. Their stay may be brief, as a brutal species seeks to enslave all in its path and kill all that resist. Terik Donato and Garett Soness will find themselves tested in the face of death, forced to become either the men they were meant to be, or the monsters they always feared they were. Survival takes its toll in this first volume of The Dawn Cluster.